In order to get the best optimization for stereo sound, you should place two Sonos Ones about 8-12 feet away from each other. Your best listening position would be 8-12 feet from the paired Sonos Ones. If you want to increase the bass, then lessen the distance between them. For better stereo imaging, you should have more space between everything. The final step is to set up the stereo pair, and this is done directly through the iOS or Android app. Just launch the Sonos app, go into More, then select Settings > Room Settings. Select one of your speakers to create a pair with, and tap on "Create Stereo Pair". The rest of the process is done through the on-screen directions. To separate a stereo pair, it's done through the app as well. Just select the stereo pair you want to separate and follow the on-screen instructions. Are multiple Sonos Ones only good for stereo sound? Not at all! You can just have multiple Sonos One speakers in multiple rooms in your home, without ever pairing them up for stereo sound. 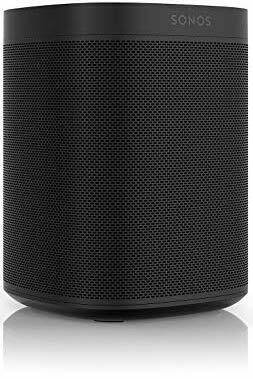 It's beneficial to have more than one Sonos One speaker when you just want to move the currently playing music to another area in the house, which is incredibly useful for large homes that may even have multiple floors. The Sonos One is also intelligent enough so that if you try to use voice commands, the far-field microphone on the nearest unit activates and responds to you. The sound quality on the Sonos One is also amazing, so multiple speakers help fill the house with rich, crystal clear sound. I definitely need more than one now! But they're expensive! Any bundles? Yes, a single Sonos One will cost $199. However, you can save a bit of dough if you purchase a multiple room set of Sonos One speakers instead of buying multiple individual units. The Two Room Set costs $379, versus $398 when you buy two separate units. A Three Room set runs $549 versus $597 when purchased separately, and a Four Room Set is $729 compared to $796 with four separate units. If you plan on getting more than one Sonos One, you should think about how many you really want before making a purchase. The more you buy at once, the more you save. But what if I don't need multiple speakers? That's fine too! The Sonos One can be enjoyed by itself too. Having multiple units definitely enhances the experience, but it's by no means necessary. The Sonos One is a fantastic choice if you're looking for a powerful and high-quality speaker at home. The sound quality is amazing, and the built-in Amazon Alexa integration works seamlessly. There's also support for Siri through AirPlay 2.